Light in many varying kinds was shown at the light-event “Light for Change” on 3rd June at the Ehrenberg campus (Technische Universität Ilmenau). This event was organized to commemorate the International Year of Light (IOY) as sanctioned by the UNESCO, and it showcased the advancements of light technology in all its glory and highlighted the message of its responsible use. Apart from the participants of ISWI 2015, visitors from around Ilmenau and the surrounding region attended this glittering evening. Over 1500 people of all ages were astonished to witness the beautifully lit campus and the colorful performances. 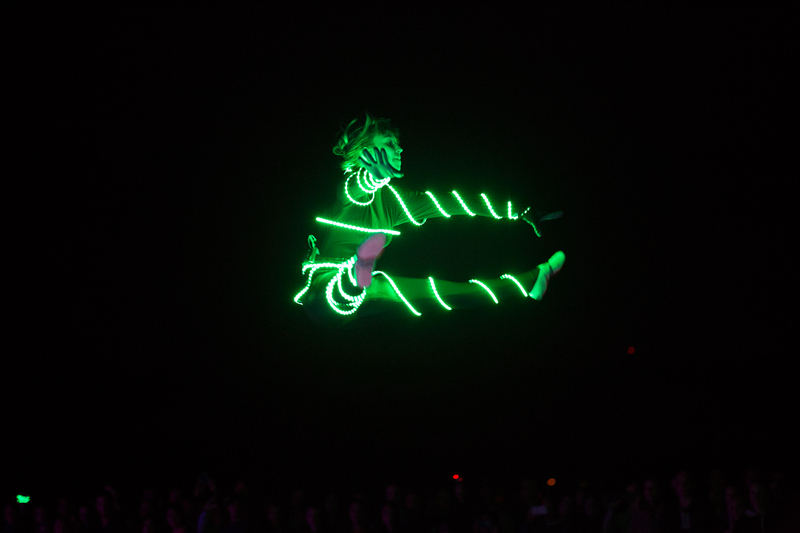 A very special highlight of the evening was the trampoline show performed by the ‘SV TU Ilmenau’ group. The gymnasts wore special black suits decorated with LEDs, which shone in different colours and displayed their splendid skills. Several hundred spectators dignified the show with their cheers and applause. All in all the visitors explored over 30 projects. One of them was ‘Flashlines’, in which the spectators could transform their artistic ideas on a building wall through a projector. In this way the Helmholtzbau was covered in many colours and different shapes. An escape via the Mediterranean Sea was visualized by 3D Video-mapping, which was a project conducted by a few talented students of TU Ilmenau. Other exhibits and performances included: shadow theatre, Black Light theatre, artistic fire show, a blind room, microscope and spectrometer demonstrations, the Colors of Light exhibition and many more!